I have this weird thing about smells. Certain food smells prompt quite a reaction out of me, almost to the point of gagging. I’m not sure where this came from or when it started; I don’t remember always being so sensitive to smell…but in the last year or so I’ve found myself miserable anytime I encounter a few certain smells. · Really ripe cantaloupe. It’s completely fine and unnoticeable until it suddenly hits a certain ripeness and Ryan MUST cut it immediately (because I can’t go near it) and get the rind out of our house! · Banana peels. I love bananas and eat one daily, but once the inside is gone I can’t handle the peel anywhere near me. Sometimes I think it won’t bother me and I’ll toss a peel into the trashcan near my desk at work…only to have to remove it a few hours later because the smell is making me sick. · Lunch meat. For a long time Ryan was on a pb&j kick and brought that to work almost daily. Recently, he’s switched to sandwiches with lunch meat and I’ve found I have to steer clear of the kitchen while he makes his lunch! 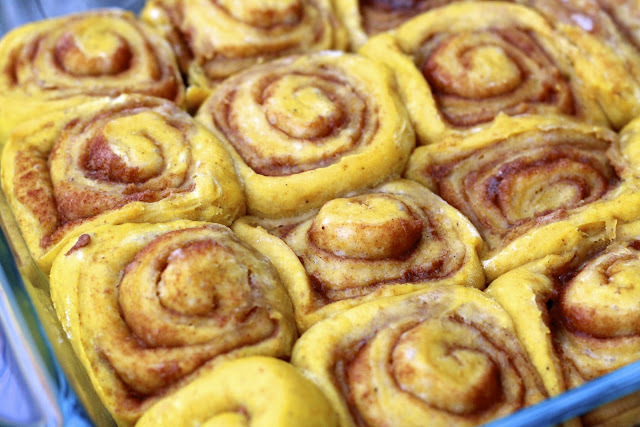 Sorry, now that I’ve grossed you all out with my weird food/smell quirks, let me tell you about a smell I do love—these pumpkin cinnamon rolls made my house smell positively dreamy while they baked. Fall baking always has the best smells, with its heavy doses of cinnamon and spice! These cinnamon rolls tasted as good as they looked. 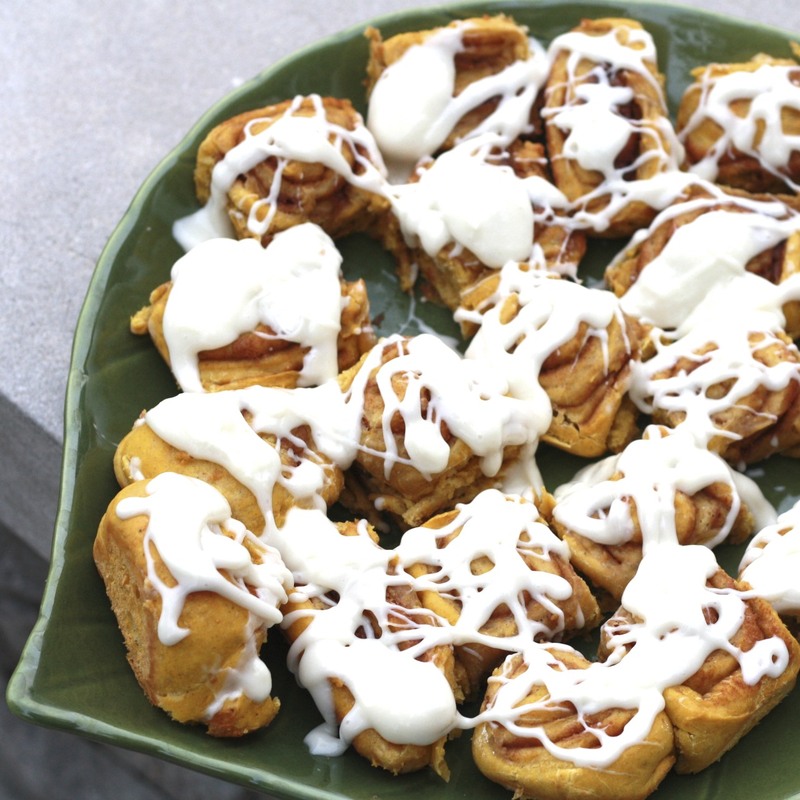 A Cooking Light recipe, they are less sinful than the Classic Cinnamon Rolls and the Cranberry Orange Cinnamon Rolls, meaning it’s perfectly acceptable to double up on the cream cheese icing! The pumpkin flavor is rather subtle, but it gives them a nice orange color and a veggie boost. I also added pumpkin pie spice instead of nutmeg to the dough for an extra boost of flavor. Best warm from the oven, they were also good a day later reheated in the microwave! What’s your favorite food smell? Least favorite? Tell me I’m not the only crazy one! 1. To prepare buns, dissolve yeast in warm water in a large bowl and allow to stand for 5 minutes. Add 2 cups flour, pumpkin, milk, butter, 1 tbsp sugar, salt, and pumpkin pie spice to the bowl. Beat on medium speed until smooth. 2. Place dough on a floured surface and add up to an additional 3/4 cup flour, 1 tbsp at a time, to prevent dough from sticking to hands. Dough will feel tacky. (Mine took the extra 3/4 cup plus a little more). 4. In a small bowl, combine 3 tbsp granulated sugar, brown sugar, 2 tbsp flour, and cinnamon. Cut in butter with two knives or a pastry blender until mixture resembles coarse meal. 5. Punch dough dough. Cover and allow to rest for 5 minutes. Roll dough out on a floured surface into a 12 x 10 inch rectangle. Sprinkle with brown sugar mixture and roll the rectangle up tightly (beginning with a long edge). 6. Pinch seam and ends to seal. Cut roll into slices (original recipe called for 12 rolls, I cut mine small to get 16) and place in a baking pan coated with cooking spray (I used an 8-inch square pan and another small dish). 7. If baking immediately, cover and let rise 25 minutes before baking at 375F for 20 minutes. If freezing, wrap tightly in foil and place in freezer. When ready to bake, remove from freezer the night before you plan to bake and place in fridge. Place on counter 30 minutes before baking, then bake at 375F for 20 minutes or until golden brown. Cool buns for 15 minutes in the pan on a wire rack. 8. 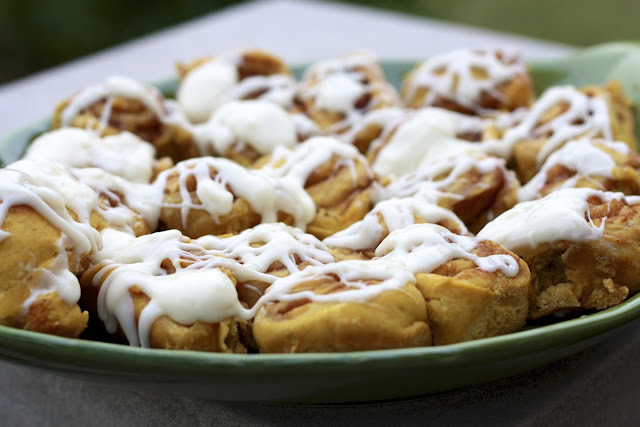 To make the frosting glaze, beat cream cheese until soft and creamy. Add milk, powdered sugar, and vanilla, beating until smooth. Depending on how thin you want it, add more milk if desired (I wanted to drizzle mine, so I added additional milk 1 tbsp at a time until I got the consistency I wanted). If you prefer really sweet icing, add additional powdered sugar. 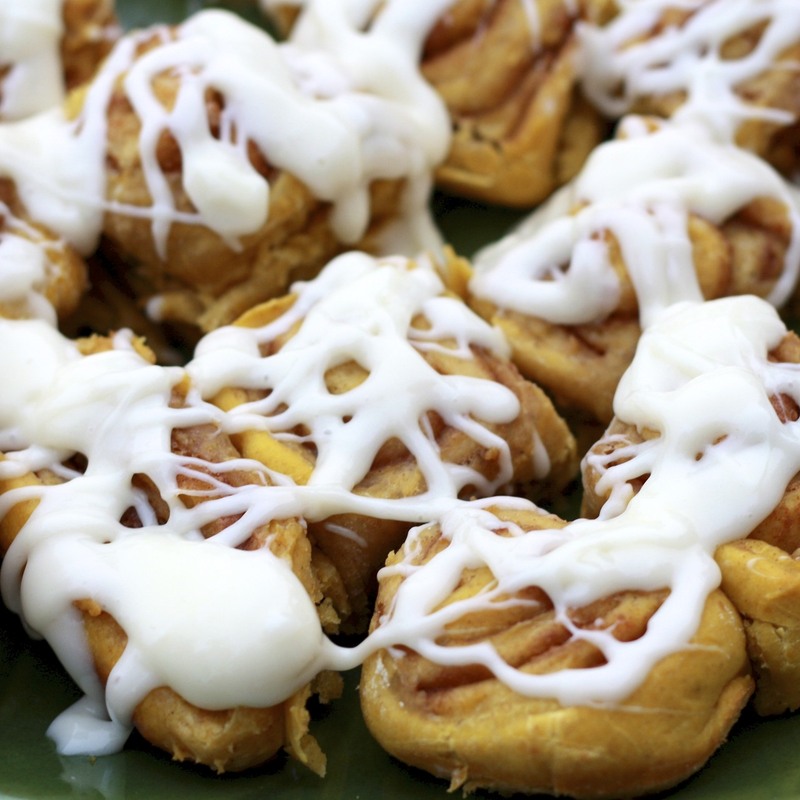 Drizzle frosting over pumpkin buns just before serving.